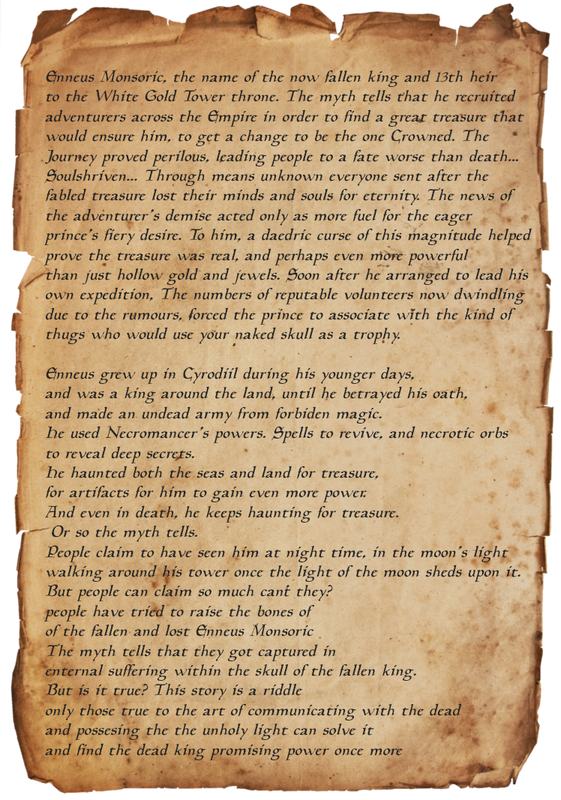 Corpus Regalis is a Necromancer cult aimed against Everglade, which is a county of a big group of High Rock's nobility. The main goal of the cult is to take over the entire of Tamriel, starting at High Rock's nobles before expanding to other lands. Basically trying to redo what Mannimarco failed in doing. But without trying to overdo Molag Bal. The cult is founded by Lord Rirvan Telvanni, a power-hungry former Telvanni mage who now works as courtmage for House Vanderlane and Goodbridge, and have connections to Everglade. Rirvan is looking for the most powerful and clever Necromancers around Tamriel to join his cult and assist him in taking over the nobles of High Rock. As I mentioned, the cult is for mainly Necromancers, so that means it's for mainly Molag Bal worshippers. This doesn't mean others aren't welcome, but they might not be as welcome as other Molag Bal worshippers. - Don't look down on anyone. We're all equal from an OOC view. - If someone/something is bothering you, contact an administrator. - Overall just please act mature. - Be loyal to the cult. - Don’t expose the cult to non-members. - Listen to your leaders. - Keep yourself and the cult anonymous to the world. Prophet - This is the leader and the founder of the cult. He is to be respected by any member of the cult. Disciple - This rank is given to the ones who have proven themselves worthy to the cult. To those who have brought the cult into better positions, and has proven they know how to lead. This is also the people who control the cult in the absence of the Prophet. Deathcaller - Deathcaller is chosen by the Disciple when proven worthy. The Deathcaller is like the ‘right hand’ for the Disciple, and therefore close to the Prophet as well. Chosen - The chosen are the people who have proved themselves higher than the average cultist. The chosen are also the people who are leaders if small groups are formed in the cult. Cultist - A cultist is a member who has proven to the prophet that they are loyal to the cult, and can officially be called a member. Deathblade - The Deathblades is the right hand of the cultist. Deathblades and cultists work close side by side. It is a job for the cultist to promote the Deathblade when he sees fit. Acolyte - Acolyte is a still a new member of the cult, and still cannot be trusted. Acolyte rank is simply gained as time goes by. Recruit - A recruit is a member who has only been around the cult for a very short period of time, and is not to be trusted yet. Citizen - The citizen is people who wanna be involved with the cult, but have not solved the sealed letter yet.